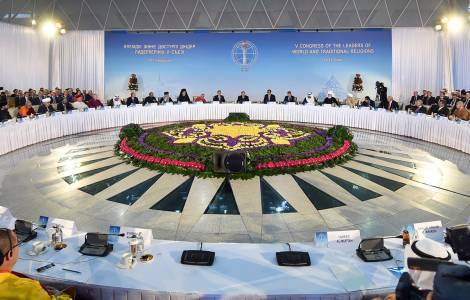 Astana (Agenzia Fides) - The "Kazakstan model" indicated by President Nursultan Nazarbayev as an example of interreligious peace and harmony to be applied on a global scale, "is real, but starts from the rather ambiguous concept that makes religious freedom coincide with freedom of worship, which actually exists in Kazakhstan, but with strong restrictions". This is what Fr. Edoardo Canetta, a missionary in Kazakhstan for many years as a parish priest and university professor said to Agenzia Fides at the conclusion of the Congress of World Religions, held in Astana on 10 and 11 October. "If, from a political point of view this Forum serves to demonstrate, at an international level that in Kazakhstan there are no religious conflicts - which is a true and positive fact - from a practical point of view the various Kazakh regional offices create meetings among the various religions, but they are very formal", explains Fr. Canetta, now a professor at the Ambrosian Academy in Milan. From 2011 onwards, the Kazakh government has made political choices to control religions, to respond to the need to stop any outbreaks of fundamentalism. Fr. Canetta notes: "Law restricts the possibility of imparting religious education. A few months ago, for example, they arrested an Orthodox priest because, during a trip to the mountains in the Almaty area, he celebrated mass in the open, in an unofficial place. In the same way, catechesis for children can only be done in the presence of parents. There are constraints for which religions are closed in their ghettos and must not interfere in the public sphere". According to the priest, Kazakhstan faces a critical point at a juridical level: "Unlike other Muslim countries, Kazakhstan signed the 1948 Declaration of Human Rights, including article 8 which establishes the possibility of conversion. In reality, those who convert are seen as a traitor: it is a non-institutionalized phenomenon, which takes place at a cultural level, given the influence of local authorities". During the Congress of religious leaders, Nursultan Nazarbayev said that "unity in diversity" is the philosophy behind Kazakhstan. "It is a principle that describes the Kazakh reality: the president, in fact - observes Fr. Canetta - is the fulcrum of the State and holds enormous power, based on the concept of concord, an aspect on which we focus very much in order to avoid clashes between Russians and Kazakhs. Religion, according to Nazarbayev’s model, is important, but it is a question that must remain confined within the life of every ethnic group".